2018 Dates: Octpber 19-31. Typically, decorations are up by mid-October, with full lighting and effects the last week of the month. This nifty little Halloween yard haunt, which started in 2011, eschews crude shocks; you will see neither blood nor chainsaw, only atmosphere. The display consists of tombs, static skeletons, ominous but subtle music, and a couple of nice effects, including a phantom figure that periodically passes through a front window – pretty impressive for an amateur effort. The Van Oaks Cemetery may be a a little too low-key to warrant a long journey all on its own, but if you reside nearby or happen to be in the area, a visit is definitely in order. Make sure to keep an eye on the haunted window - one of the best spectral manifestations you will see at any Halloween attraction, amateur or professional. 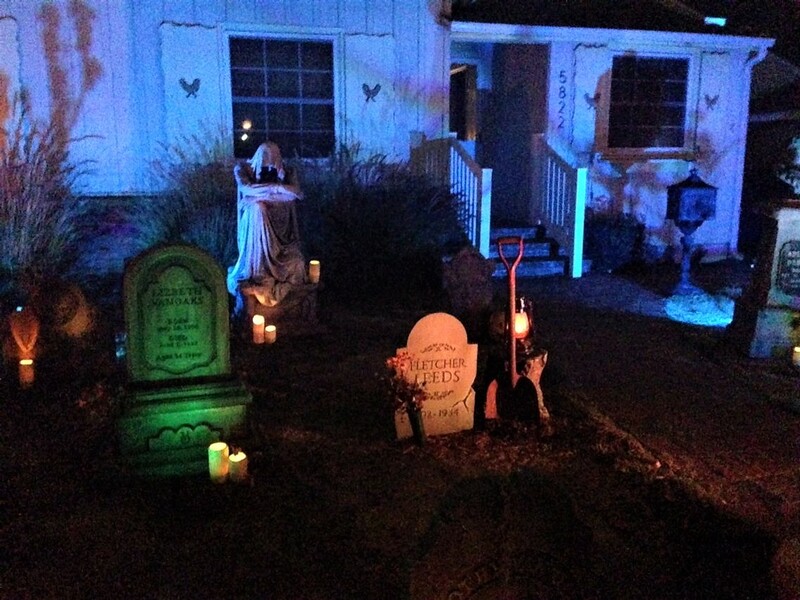 The neighborhoods around Van Oaks Cemetery are prime hunting grounds for Halloween fans. Many of the side streets that cross Hatteras, running parallel to Norwich Avenue, have decorated houses, especially Willis Avenue between Hatteras and Collins. One of the most visible home haunts is two blocks west of Norwich, on the corner of Hatteras Street, at 5758 Burnet Avenue; after visiting Van Oaks Cemetery, it is worth swinging by this one, which features a large display of static props on the yard and in front of the house (photos here). Slightly farther away and to the east, on Saloma Avenue north of Martha Street, is the Spooky Saloma Block Party, a series of home haunts, also worth checking out. The Spooky Saloma yard haunts are listed here. A ghost peers from the haunted window. The ghost evaporates from the haunted window.